Finally, some leaves have appeared on my tree! I think it is an elm tree. My grandparents had an elm tree on the northwest corner of their house lot. Its branches and leaves could almost be touched when looking out the window of the green bedroom, feeling like the leaf canopy of this elm in the above picture. Toby went into the hospital for cancer surgery five days ago, and will probably be staying there for another week or so. The day he went into the hospital I had to go up to my father’s house for a few days to help out with the ancient ones. Chelsea had some time off so my aunt Em from Maryland came up and she and I tried our best to fill Chelsea’s shoes! It’s good to be back home now and slip into a more “normal” routine again, at least for a little while. Up at my dad’s it was so quiet without Bernie around, but I was able to get outside for a short walk and take a few pictures. Later, while sitting on the porch watching birds with Dad, I experimented with the telescopic lens and got a fairly decent picture of a nuthatch (below), if a little blurry! But next time I think I will use the sports setting with the auto-shoot feature. It worked so well today with the flag picture this morning (above), which was whipping in the wind. Enjoy! The Moss family loves everything green. Kelly and Hunter and their children Willow and Sage own the Green Is King Factory. They turn their precious blue and yellow finds into, you guessed it, green. It’s hard to keep up with the demand. Artists use a lot of green! From the gentle yellow-green buds of spring to the deep shades of the forest, the Moss family can have an artist’s favorite green within 24 hours (and yes, express delivery is available). So, the wondrous fairies have a factory in their village, too! Did you notice the cog railway for bringing the yellow down to the factory? What a blessing our in-home caregiver, Chelsea, has turned out to be! She spent Monday in the hospital keeping Auntie company. Thank you so much, Chelsea! You are truly a godsend! On a somber note, I received some sad news yesterday, my cousin Matt called to let me know that his mother, my Aunt Betty, died unexpectedly Friday evening. She had enjoyed her last day of life, taking a wonderful long walk with her husband, my Uncle Dave, and seemed fine. But after dinner she collapsed and the paramedics were summoned – she was 80 years old. Matt and I talked for over an hour on the phone, shedding a few tears and sending hugs back and forth, sharing what happy memories came into our minds. Tim & I had sent her some organic roses in May for her 80th birthday and she told us their fragrance reminded her of romantic rose gardens from the past on Cape Cod. Aunt Betty was a woman of strong faith, a lovely, gracious, lady. The gaps are the thing. The gaps are the spirit’s one home, the altitudes and latitudes so dazzlingly spare and clean that the spirit can discover itself like a once-blind man unbound. The gaps are the clefts in the rock where you cower to see the back parts of God; they are fissures between mountains and cells the wind lances through, the icy narrowing fiords splitting the cliffs of mystery. Go up into the gaps. If you can find them; they shift and vanish too. Stalk the gaps. 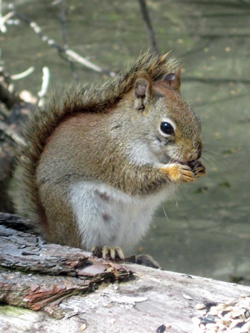 Squeak into a gap in the soil, turn, and unlock–more than a maple–universe. Yesterday we had a taste of summer. Low 70s! Janet took Tim and me on an adventure through her neck of the woods. 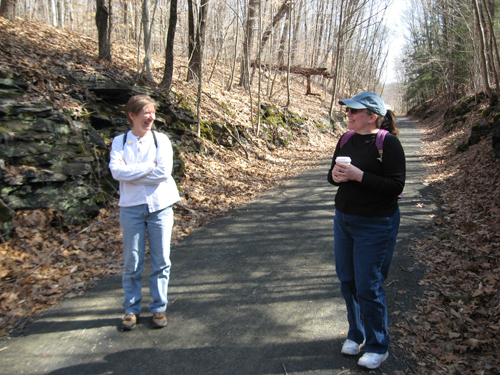 First we took a hike on the Old Airline Trail – can’t remember which section – that runs across eastern Connecticut. It’s one of those Rails-to-Trails projects. We crossed over a very tall viaduct and were treated to lovely views, although everything is still brown and gray from winter. The trail also cut through some hills so we saw a lot of water from the saturated earth dripping down the moss and rocks bordering much of the trail. 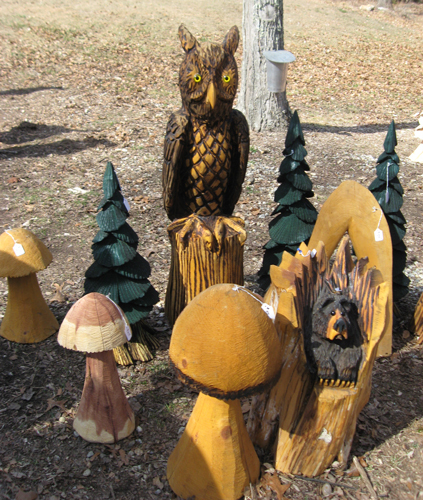 Next stop was the Hebron Maple Festival. By then it was lunch time and uncomfortably hot in the sun. It was a relief when we got to the chainsaw woodcarving demonstration that was tucked in the woods on a back road, and of course we bought some real maple syrup! And finally we stopped at Tangletree Farm in Colchester where Roger had been joyfully riding his horse, Tsultan. Janet introduced us to all the horses in the barn, including a new foal. He was born on Saint Patrick’s day, so his name is, of course, Patrick. He was very busy nursing so I couldn’t get a better picture of him! Also, I did a brave thing, brave for me. I fed Janet’s quarter horse, Cruiser, a couple of carrots and actually petted his nose! When I was in eighth grade a girl in my class fell off a horse, broke her neck, and died one weekend. It was such a shock to come back to school on the following Monday and hear this news! And back in those days they did not have grief counselors come to a school to help students cope with their losses. The whole episode left me profoundly afraid of horses. But I have a feeling that this may be about to change. Needless to say, we were pretty tuckered out by the time we got home last night. Today we’ve been catching up with computer stuff and a stew is in the slow cooker, and dinner is smelling good!